Ordinary looking umbrella and walking cane with covert sword blade. The natural finish hardwood hook handle opens to reveal a double edged sword blade. The silver umbrella tip doubles as a jabbing weapon. 35 in. overall closed, 15 in. blade. The ubrella works good to keep you dry, the sword is good for close quarters if needed had to sharpen it, but for the price its a great buy. The umbrella part is a bit small when open. However I was very pleased with this product. An hour or two of sharpening and its perfect. Basically just a prop. The blade is not sharp, umbrella looks like it will disintegrate upon getting wet, and the tip is not sturdy. I cannot recommend this as anything other than a mantle piece. The blade is smaller than the picture led me to believe and very dull. Otherwise, the umbrella looks and works well and seems very sturdy. The blade can be easily sharpened and the tip is solid. 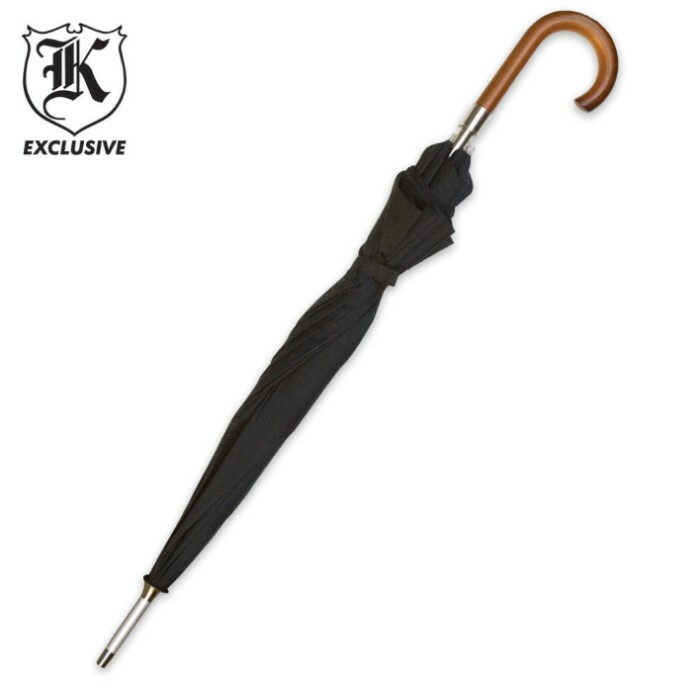 As far as the umbrella goes, it's probably the best quality umbrella I've ever bought - very sturdy and nice looking, but this is BudK and we shop here for swords not umbrellas. The sword is very short, not nearly the length of the umbrella handle. It came dull - extremely dull. It's actually the dullest knife I've ever bought from BudK. And if you bang around or swing around the umbrella you can hear the knife banging up against the sides of the metal. The umbrella's nice though, and I've sharpened up the sword a bit, though it's going to take many more hours to sharpen it to good defense standards, it's still a nice umbrella to use and fun to know that I have a weapon hidden away in there. The umbrella probably won't stand up to much wind considering it has no latches for opening or closing. 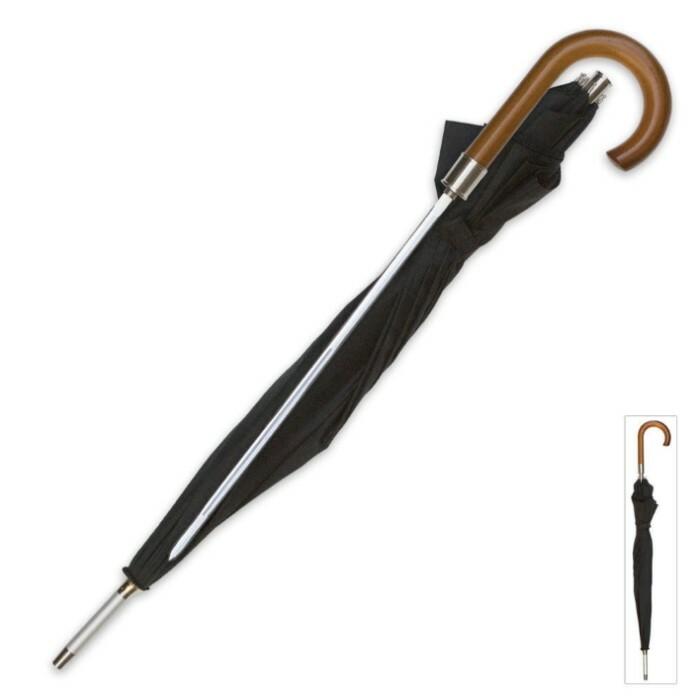 You simply push the umbrella open and mild tension holds the umbrella open. Regardless, I didn't buy the Sword Umbrella for rain protection. I wanted the protection provided by the hidden blade. Don't be fooled by the picture. The blade is exactly 15" long. The sharpened edge is only 13" long. The blade has some weight to it so it isn't totally unusable for defense. However, the edges are extremely dull...not much sharper than my letter opener. I hope to remedy this with my Dremel and sanding bit. It's too coarse for my Budk fine knife sharpener and I don't want to spend another $13 for a fine/coarse Budk knife sharpener. Fool me once, shame on you; fool me twice, shame on me!!! When shipped the handle was broke off. I had to super glue it back on, hopefully it stays. The double edge blade is not sharp. The umbrella and walking tip is nice. Nice looking, could hardly believe the umbrella held a sword of such a fine edge, nice and sturdy, a great buy.